Saving Lucas Biggs, by Marisa de los Santos and David Teague (HarperCollins, middle grade, April 29, 2014), opens with an innocent man being sentenced to death. Margaret's father was a whistle-blower, a geologist who publicly decried the fracking that was poisoning the water of Victory. He was accused of murder and arson, and Judge Biggs, a company man through and through, had no qualms whatsoever condemning him. The story of Joshua's life in 1938, alternating with Margaret's in the present, tells of all the suffering of the minors' families, and the heartbreak of how close things got to a peaceful resolution. Listening to Joshua talk of his old friend, and how he changed, it becomes clear to Margaret that the only way to save her father is to save Lucas Biggs. And Margaret thinks she might be able to do this, for her family can time travel. So she goes back to 1938, and pushes against the weight of history, as she tries, with young Joshua's help, to keep the innocent from being killed. 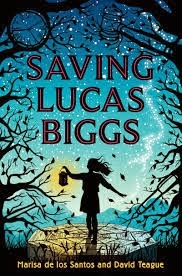 Saving Lucas Biggs has memorable characters, an intriguing premise in which details keep getting added to the story back in the past making it kind of like a mystery, and there is tons of truly heart-touching emotion and shoulder-clenching suspense (shoulder-clenching because that's what happens when you read about it). The time travelling came some ways into the book, but it was satisfying time travelling--the authors did a fine job of sending her back in time with her mission front and center, and, along with Margaret herself, they refused to get distracted by things irrelevant to the matter at hand. In short, I can imagine lots of kids enjoying it lots as an exciting adventure story combining past and present danger. But what I really want to say is Yes! for a book that tackles corporate greed and corruption and puts it in historical context! Yes for a book that uses a kid friendly premise and story to show the atrocities committed by the ruthless companies! (The atrocities are described--people, just sitting in the tent camp, are gunned down, and are killed and mutilated--but they are described in a factual, un-hysterical way that makes it possible to move through the horror without nightmares). And Yes for a book that advocates for non-violent resistance inspired by Quakerism! Maybe it's not, you know, subtle, and the ultimate ease of the ending did kind of disappoint me more than somewhat, but still, how can I not say yes to a book that combines such powerful points with an engaging story? "North Carolina legislators are considering a bill that would make it a crime to publicly disclose toxic chemicals that energy companies use in the hydraulic fracturing process, with offenders on the hook for fines or even jail time." It seems like even medical and emergency personal couldn't talk about the toxic chemicals used in fracking even if they were directly copying with their repercussions. And continuing with the real world connections--here's a petition to ban fracking in the area of New Mexico's Chaco Culture National Historic Park. Whoa, I didn't know Marisa de los Santos had ventured into the realm of YA fiction. Have you read her adult books? Falling Together was only so-so, but I absolutely love Love Walked In and Belong to Me, and I reread them all the time. I have not read any of her books, but I'll look for the two you mention (is trusting). Time travel AND history AND corporate greed. This would be a really hard sell in my school. There's been a big shift away from fantasy-- all the students seem to want is magical realism. I'll have to see what the new 6th graders will read next year. Why no fantasy sports books? Hmmmm. Seems like a law that, if passed, would last as long as it took a federal judge to tag it on First Amendment grounds. Sounds like an ambitious book. And yes, the current legislators in NC seem to want to do as much damage as possible.